Do you treat customers uniquely, recognising their individual preferences that encourage them to stick around and come back often? The ability to reflect your customers' stated and unstated needs should be one of your highest priorities. According to Forrester Research, when companies successfully personalise their content and offerings, the rewards pay off in huge ways—including significant boosts in customer retention and return. Your customers expect personalised experiences. 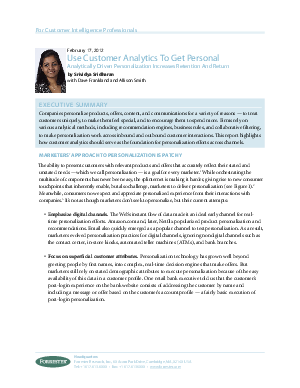 If you want to outpace your competition, then using customer analytics to personalise is a must. Download Forrester's latest research to drive personalised experiences on your site.